Today we honor those who have fallen in the name of preserving our way of life. This includes but is not limited to the greatest generation that kept us safe – those who fought and destroyed fascism in the 1930’s beginning with those who volunteered against future right-wing US ally the fascist Franco in the Spanish Civil War in the Lincoln Brigade and culminating with those heroes who were ready to invade the island nation of Japan in 1945 when Emperor Hirohito surrendered. The United States of America helped lead the Allied coalition that defeated Hilter, Tojo and Mussolini. Our men and women sacrificed for the cause of freedom and secularism. We led the world into its most prosperous, global and liberal era of modern times. A new exchange of ideas and scientific advances unparalleled in human history followed the defeat of fascism. But even the most enlightened ages come to an end and the postwar boom has now given way to resurgence of anti-modernism and anti-intellectualism. Today we face a real fascist threat at home in the Presidency of a tin-pot wanna be authoritarian in Donald Trump and abroad in the form of those the President has aligned with. Trump’s political rhetoric is reminiscent of the same national socialism the greatest generation fought and defeated on beaches of Normandy, the hills of Monte Cassino, the deserts of North Africa and all points in-between. But Trump himself is weak willed person – his rhetoric might be comparable with worst of fascist dictators and authoritarian figures of the past, but his actions show an ability to pushed and manipulated by those he is intimidated by or wants to emulate. 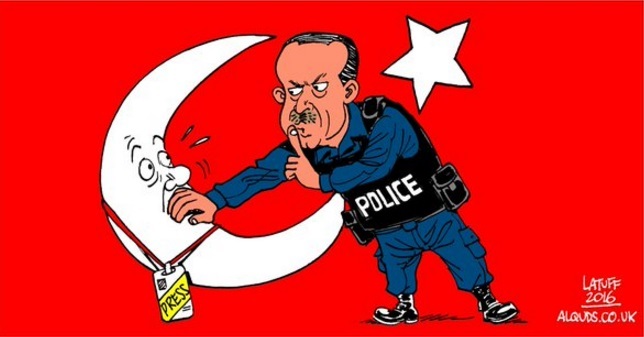 Enter the fascists from abroad such Saudi Arabia, Qatar, ISIS and authoritarian regimes like that Erdoğan in Turkey, Putin in Russia or the Chinese communist party. In Donald Trump they’ve found a champion – an American leader with authoritarian instincts, a disregard for public opinion and a weakness for manipulative strongmen. Under Trump, the US despite the rhetoric during his candidacy has shifted from a leader in the fight against fascist-inspired terrorism to accommodation with the those backing the terrorists. Particularly worrying is Trump’s alliance with Saudi Arabia and his extensive connections to Erdoğan initially consummated it appears through disgraced former National Security Adviser Michael Flynn who was on the payroll of the Turkish government. Trump’s alliance with Saudi Arabia has realigned the US with a state whose treatment of women is perhaps the worst on the planet a nation which treats migrant workers in many cases as slaves (which is commonplace in the Persian Gulf region among Sunni Muslim governed states) and who via various means have been supporting the very terrorists promoting fascist beliefs who have brought terror to our soil, as evidenced most notably here in Florida by the Pulse massacre. CNN and The Washington Post’s Fareed Zakaria this week correctly called out the Trump-Saudi alliance on both his GPS program and in a Post column. Trump’s alliance with the Saudi’s, indulgence of the Qatari’s and seeming man-crush on Erdoğan put American values – freedom, secularism, advances in science and culture as well as our national interest in serious jeopardy. However, the American left with it’s personality driven-politics and hypocrisies hasn’t covered itself in glory either. The racing to politicize any event that makes Trump look bad while many remain in complete denial about the right-wing nature of fundamental Islamic terror and that those who are in sympathy with these views being in fact unworthy of the type of protection and sympathy liberals give them time and again. We saw this after the Pulse massacre by an Islamic fascist here in Florida and once again this week after the events in Manchester – which is one of the most enlightened and liberal places in the western world. Make no mistake about it – radical Islam IS violent and has strong strains of fascism, anti-gay/LGBT, misogynistic and anti-Semitic ideologies contained in it. And yes, many Muslims in the United States have been radicalized just as they have in Europe – perhaps not in the same manner or numbers but they do represent a threat. They take their inspiration from ISIS and the brand of Islam being advanced by Trump’s allies in Saudi Arabia. Of course most Muslims aren’t radical Islamists or fascists but enough are to make it critical that the left be willing to put aside complete and utter political correctness in the name of a phony doctrine of tolerance to call it what it is. A higher percentage of Muslims have been radicalized today per polling than at any time in history. Islamic fascism IS fundamentally and ideologically the same thing as radical conservative orthodox Christianity – and perhaps even more violent. We on the left have for years been willing to heroically stand tall and strong against great opposition in our communities in order to advance secularism and call out the intolerance and hatred of the religious right – but now it’s obvious the religious right must be Christian and not Muslim to get the full scrutiny of those on the left. The ideology which is anti-modern and intolerant is the very definition of conservatism. Yet somehow many on the left in the United States feels tolerance means that calling out radical Islam or even calling it that is a no-no. But as we’ve discussed in the past on this site the left’s views on what defines tolerance have undergone a metamorphism recently – as evidenced by the unwillingness to even listen to conservative commentators and the growing tendency to either call all Trump voters racists or wish ill on those voters and the regions they hail from. Islamism is a right-wing ideology on par with religious fascism (as practiced in Franco’s Spain and for the beginning of his regime, Salazar’s Portugal) and similar to the views of many on the American right. We now see a convergence in interests between the Islamic fascists and President Trump (despite Trump’s anti-Muslim campaign rhetoric which was clearly designed to throw red meat to a segment of largely ignorant and quite possibly racist voters) who have created an alliance of shared values and shared interests in Trump’s first months in office. But while Trump aligns with the fascists in Riyadh, Doha and Ankara, the left remains obsessive about Russia and is unwilling to stand up and be counted in favor of President Obama and Secretary Kerry’s seminal achievement – a nuclear deal with Iran which represented a diplomatic breakthrough and a critical pivot for the United States away from tacit alliance with ISIS via its backers and ideological soulmates and toward balance in the Middle East and accommodation with the Russian bloc. The obsession of some Democrats with Russia and Putin has led them apparently to view Iran once again as an enemy, giving the Saudi’s covert cover on the left as they promote fascism and terrorism here in the west. This Memorial Day those of us on the left have to begin a new fight on fascism – both here at home and abroad and that involves being realistic and a willingness to drop political correctness in favor of true secularism and tolerance.